An example of a whole pot found purposely broken within the rectangular Roman pit. Archaeological investigations have unearthed traces of a Bronze Age settlement and Roman remains at the historic Santa Margerita Cemetery, in Rabat, the Superintendence of Cultural Heritage has disclosed. Having completed the scientific investigation, the Superintendence is studying the best means to preserve the remains on site with the Health Department, the Acting Superintendent of Cultural Heritage, Nathaniel Cutajar, said. The investigation followed the discovery of remains during construction works to extend the burial ground by the Health Department. The traces of a Bronze Age settlement within the cemetery enclosure are "possibly the single most important discovery", Mr Cutajar said, explaining that it is the first scientifically attested finding of prehistoric remains in Rabat. The find pushes the foundation of the town back to the 10th century BC at the latest. The construction works at the cemetery last year had made no provision for archaeological monitoring, so the report on the site's discovery reached the Superintendence with some delay, Mr Cutajar said. A member of the public had reported that large masonry blocks, which appeared to be of an archaeological nature, possibly Roman in date, were being uncovered at the site. An inspection by officers of the Superintendence established that the report was correct since the foundations of a Roman structure could clearly be made out at the indicated location, Mr Cutajar said. "In many ways, the discovery was not surprising, the site of the cemetery extension lying midway between the Roman Domus and the area of Doni Street, has yielded important archaeological discoveries over the past 100 years," he said. The Superintendence had to invoke the Cultural Heritage Act to stop the works in order to assess the situation and to record the emerging archaeological situation within the new cemetery grounds extension. Negotiations with the developer took almost a year to complete and archaeological excavations were initiated this summer, Mr Cutajar explained. The excavations were carried out under the direction of the Superintendence and funded by the Health Department. The scientific investigations conducted have indicated various traces of a Bronze Age settlement within the cemetery enclosure - an important find that takes on even greater significance if put within the context of other Bronze Age discoveries at Mtarfa and Mdina. The cluster of findings indicates that between the middle and late Bronze Age, a substantial prehistoric settlement had developed in and around Mdina, Mr Cutajar explained. "Until recently, the origin of Mdina as the main town of Malta was attributed to the Phoenicians, who were credited with the foundation of the township of Melita in the late 8th century BC at the earliest. The site of the Phoenician colony was, of course, that of modern-day Mdina. "The 2005 excavations carried out by the Superintendence in Mdina, and those carried out this summer at Santa Margerita in Rabat have demonstrated, without a doubt, that a considerable settlement existed in the area at least 400 years prior to the arrival of the Phoenicians in Malta." Excavations have also uncovered extensive Roman remains, datable to the mid-Imperial era (around the 2nd to the 3rd century AD). "The large blocks, which had originally attracted the attention of the public to the site, seem to belong to the remains of this historical period," Mr Cutajar said. A wall of massive, rectangular, limestone blocks, which survives to a height of almost two metres, has been uncovered, while traces of less massive structures have also been detected at the site. The purpose of the massive wall was not immediately clear and required further study, Mr Cutajar said. However, it was clear that what the recent excavations uncovered was part of a larger structure - possibly of an enclosure wall for a high status building that stood further uphill from the current excavations. A rectangular pit, cut into the bedrock and containing numerous remains of apparently whole pots, purposely broken and dumped into it, has also been discovered, Mr Cutajar reported. 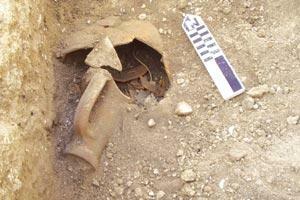 An amphora, probably originating from Lazio, was found broken, but otherwise complete, within the pit. It has helped date the feature to around the 2nd century AD, he said. The purpose of the pit is not yet known, however, a ritualistic function could not be excluded, Mr Cutajar added.